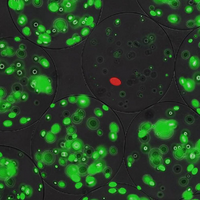 Researchers use the genome-editing tool to mutate binding pockets and identify potential anti-cancer drug targets. 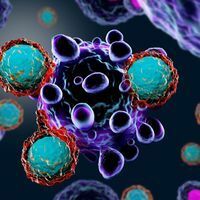 Using the CRISPR/Cas9 genome-editing system to mutate the gene regions encoding particular protein domains could result in a new and more efficient method to screen for druggable protein targets critical to the survival of cancer cells, according to a study published this week (May 11) in Nature Biotechnology. Current CRISPR-based screens often mutate the beginning of a gene, which sometimes results in the expression of a functional protein variant. 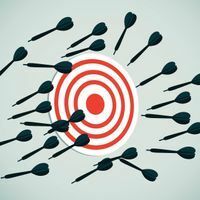 To circumvent this problem, researchers at Cold Spring Harbor Laboratory (CSHL) designed CRISPR guide RNAs that would mutate the portion of a gene encoding a domain on the surface of the protein where a small molecule could bind to alter the protein’s function. 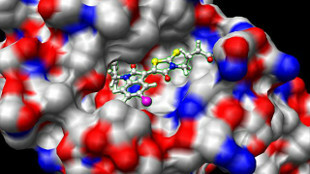 The team had previously identified such a binding pocket on the protein BRD4, and a small molecule inhibitor that binds in the pocket is an effective leukemia treatment. In the latest study, the researchers targeted 192 chromatin regulatory domains expressed in mouse acute myeloid leukemia cells, using CRISPR to mutate the DNA sequence encoding these domains and thereby change the protein pockets’ shapes. Targeting specific domains resulted in more efficient elimination of functional proteins from the cells than mutating the start of the gene, thereby increasing the power of the screen for proteins that were critical to the cancer’s survival. 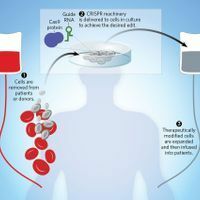 The CRISPR mutant screen revealed 25 proteins that reduced leukemia cell survival when mutated, including six previously known proteins that are already being targeted therapeutically and an additional 19 that had not been identified before.